What's the first thing that comes to mind when you think of Caribbean Food? Probably spice... lots of flavour... party time, great drinks and total fun! 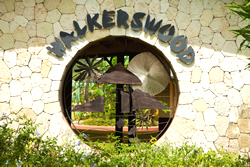 Walkerswood is the name of a village in rural Jamaica hidden in the green hills of St. Ann. There at the local factory, we prepare delicious sauces, seasonings and condiments from freshly harvested produce grown in the surrounding country side. The Walkerswood Caribbean Foods Factory is a growing supplier of over 20 innovative and traditional products which are essential for the easy creation of Caribbean dishes. We are obsessive about quality and taste so you have stopped at the right place if you have discovered Walkerswood.